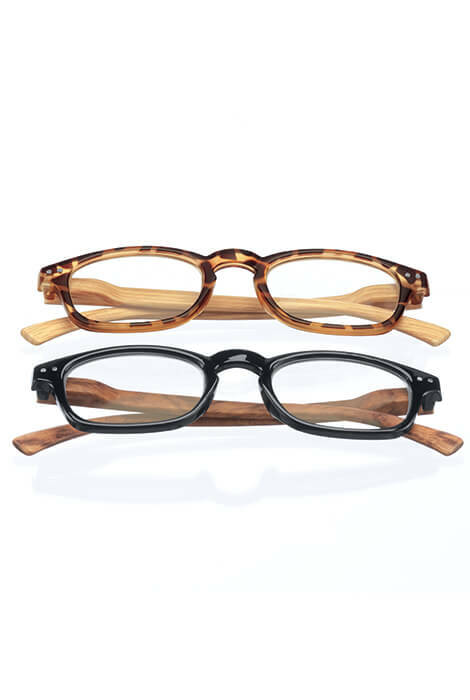 Classic reading glasses with wood grain bows feature a realistic wood-grain look for vintage style. Designed for men or women, these lightweight, durable plastic readers eyeglasses are perfect for reading and computer use. Spring hinges provide a flexible, secure fit for long-wearing comfort. With this 2-pair set you’ll always have a spare pair on hand. Includes one pair of black frames with brown bows and one pair of tortoise frames with blonde bows. Choose from 10 magnifications, including hard-to-find 6.00X: 1.50X, 2.00X, 2.50X, 3.00X, 3.50X, 4.00X, 4.50X, 5.00X, 5.50X, 6.00X. Specify magnification: 1.50X, 2.00X, 2.50X, 3.00X, 3.50X, 4.00X, 4.50X, 5.00X, 5.50X, 6.00X. The wood grain bows are different from other reading glasses I own. Liked the style and they had the optical strength I needed. Good price for 2 pairs of reading glasses.